Once you arrive in Mauritius, meet representative who helps you with an assisted transfer to your pre-booked hotel (ANELIA RESORT & SPA). Have dinner and retire for an overnight stay in the comforts of your room. 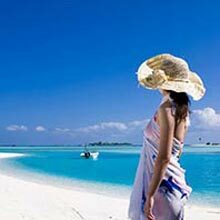 This excursion is an insight into a different taste of Mauritian scenery. From Curepipe, a road leads up gently to Trou-aux-Cerfs, a dormant volcanic crater, walled with a dense vegetation. From there, enjoy a panoramic view over the island and its mountain ranges. Then proceed to Le Port to see expert craftsmen working on models of genuine 18th century sailing vessels. You can purchase ship replicas on display and have your purchases neatly packed for your journey home.You will proceed to Mangal Mahadev the 108 feet Shiva statue, then a stop to “Ganga Talao”, the Ganges reincarnated in a holy lake and a pilgrimage spot for Hindus giving a great taste of our culture. The trip continues through the forest reserve of Plaine-Champagne, with a photo stop at a viewpoint over the spectacular Black River Gorges. Down the fertile valley, the drive, lined with sugar cane fields and pineapple plantations, leads to Chamarel where a magnificent waterfall and the unique seven-coloured earths of Chamarel awaits you. 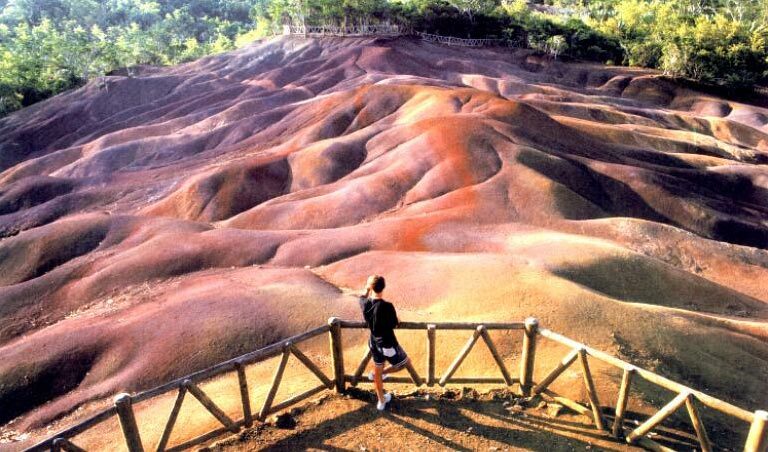 The unusual mounds of undulating land stretching in contrasting rainbow-coloured layers of earth are believed to be of volcanic origin. On the return journey, stop at the viewpoint dominated by Le Morne Mountain (a World Site Heritage by UNESCO), Ile aux Benitiers and the South-Western Coastline for some memorable holiday pictures. Labourdonnais. A photo stop at La Citadelle, old fortress built in 1834, which offers a vast panorama on Port-Louis and its harbor. A ride uphill to the Fort guarantees a breathtaking view of Port Louis and of the mountain range surrounding Port Louis. Visit Caudan Waterfront, a modern precinct facing the harbour. Its 170 boutiques display beautiful collections of local designers and famous brands. Its Craft market is an open bazaar, impregnated by exotic scents of spices,souvenirs and basketry. Last stop at Bagatelle shopping Mall. On the beautiful Ilot Margenie Island, a delicious BBQ lunch will be served. The lunch menu consists of BBQ Chicken and grilled fish, sausages, salad rawness, butter garlic bread, fresh pineapple. In case you are a vegetarian, we will be glad to arrange veg lunch. During the lunch, you will be able to enjoy a complimentary selection of drinks including both soft drinks and alcoholic drinks; Water, Soft drinks, Rhum, Cola, Wine and Beer. You will end this delicious lunch with a local dessert of fresh pineapple. Enjoy different water activities at a supplement (even for non-swimmers). As part of this speed boat trip you will get to enjoy sailing through the crystal clear water of the east coast lagoon with breathtaking scenery all around. 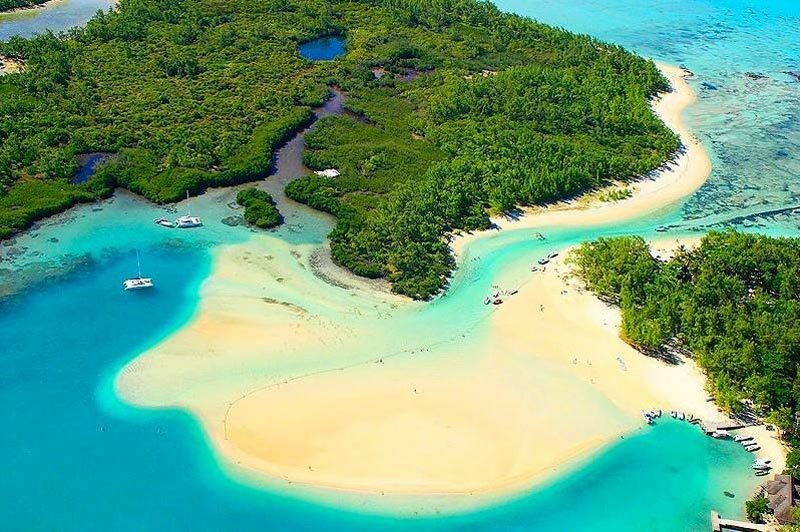 You will get to stay on one of the picture-postcard beach of Ile aux Cerfs, The highlight of your holiday could be a dream trip along the East coastline on one of our fiberglass speedboats, This exciting cruise starts Trou d’eau Douce.